The American Dream is in serious danger, according to Robert Wuthnow--not because of economic conditions, but because its moral underpinnings have been forgotten. In the past this vision was not simply a formula for success, but a moral perspective that framed our thinking about work and money in terms of broader commitments to family, community, and humanitarian values. Nowadays, we are working harder than ever, and yet many of us feel that we are not realizing our higher aspirations as individuals or as a people. Here Wuthnow examines the struggles in which American families are now engaged as they try to balance work and family, confront the pressures of consumerism, and find meaning in their careers. He suggests that we can find economic instruction and inspiration in the nation's past--in such figures as Benjamin Franklin, for instance, who was at once the prudent Poor Richard, the engaged public person, and the enthusiastic lover of life. Drawing on first-hand accounts from scores of people in all walks of life and from a national survey, the book shows that work and money cannot be understood in terms of economic theories alone, but are inevitably rooted in our concepts of ourselves and in the symbolic rituals and taboos of everyday life. By examining these implicit cultural understandings of work and money, the book provides a foundation for bringing moral reasoning more fully to bear on economic decisions. It re-examines the moral arguments that were prominent earlier in our history, shows how these arguments were set aside with the development of economistic thinking, and suggests their continuing relevance in the lives of people who have effectively resisted the pressures of greater financial commitments. Demonstrating that most Americans do bring values implicitly to bear on their economic decisions, the book shows how some people are learning to do this more effectively and, in the process, gain greater control over their work and finances. 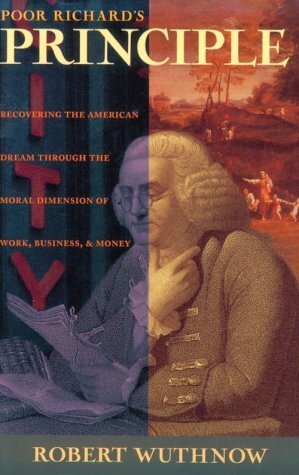 At a time when policymakers are raising questions about the very survival of the American dream, "Poor Richard's Principle" offers an analysis of how moral restraint can once again play a more prominent role in guiding our thinking.